My baby boy, you’re 6 months old! Wow. I can’t believe it has already been half a year since our baby was born. 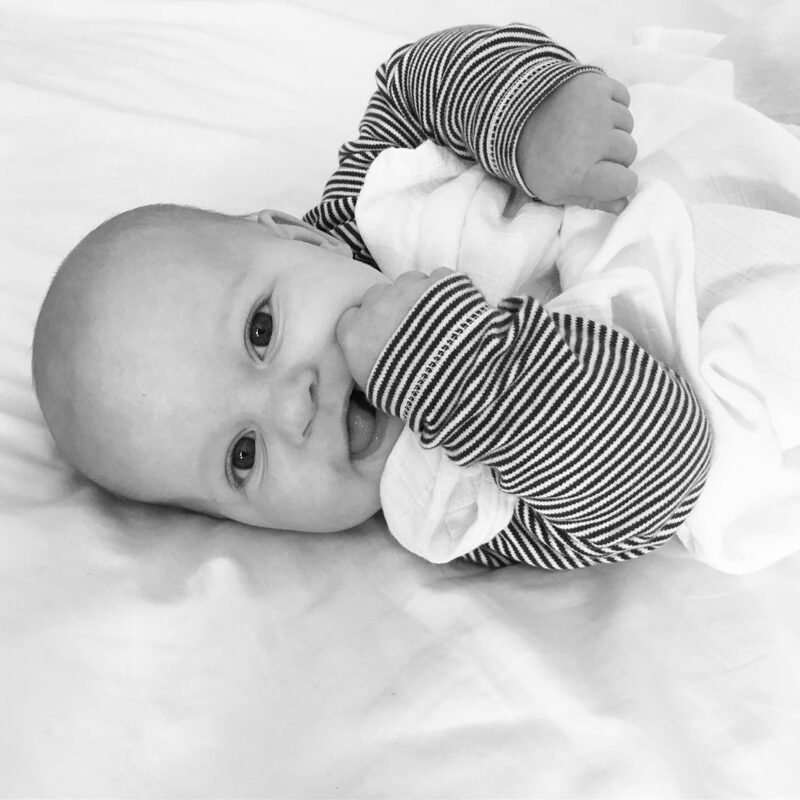 I can barely remember him as a tiny baby already, he seems to have always been the cheeky little boy I see every day. His personality is really shining now, everyone says his smile is just so cheeky! He is becoming more determined and he knows exactly what he wants, and when he wants it. He has these little flappy arms that come out if he wants something that you have, he just bangs his hands on his lap, with a look on his face that says ‘give it to me!’. 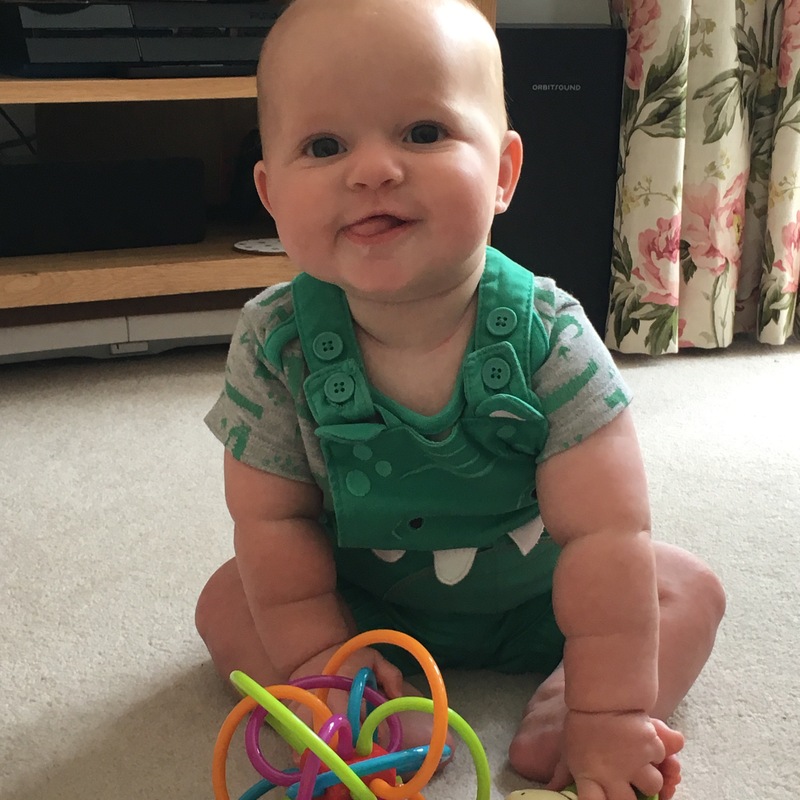 This month he’s mastered sitting up, he can’t pull himself into a seated position yet, but if you place him sat down he will happily sit there and play with his toys. He’s really starting to try to move now as well, when sat up he leans himself forward and gets himself on all fours and rocks back and forth. When he does try to actually move, he generally ends up flopping onto his tummy or goes headfirst into the floor! When he lies down on his tummy he now ends up doing what I call ‘the slug’ whereby he slides along the floor/bed/flat surface on his tummy, he looks so funny, but he moves so quickly! He can lap his cot in about 20 seconds, if not less! We have now stopped using the bath support at bath times as Oliver can sit up and holds his head up for long periods of time. He’s really enjoying the opportunity to now have a really good splash about. 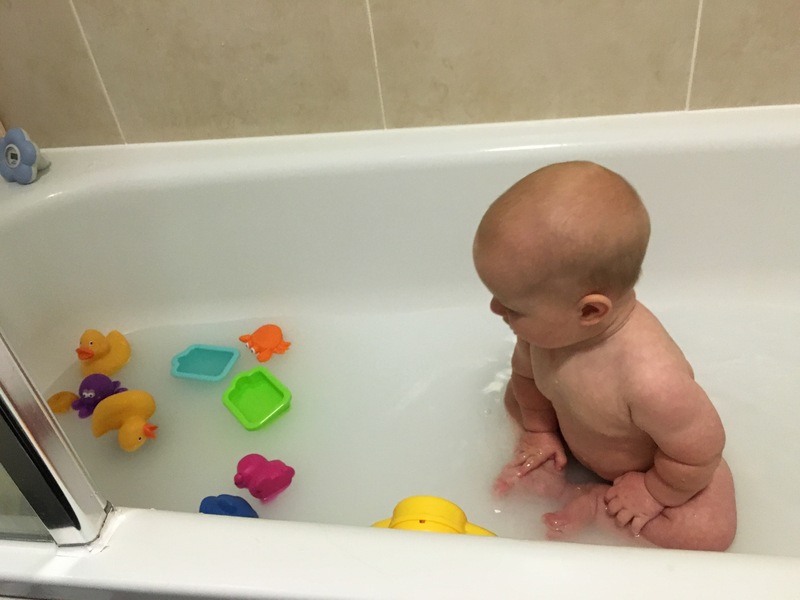 He’s a bit sceptical of bath toys, I think he doesn’t like it when they float away when he reaches out to grab them! Tonight he finally didn’t cry at the bath toy, I switched from the fish that always makes him cry, to the car (I’m sure Stu will be happy with that!) so he is obviously going to take after his father! We decided to take Oliver for his first swim this month and he really enjoyed himself. 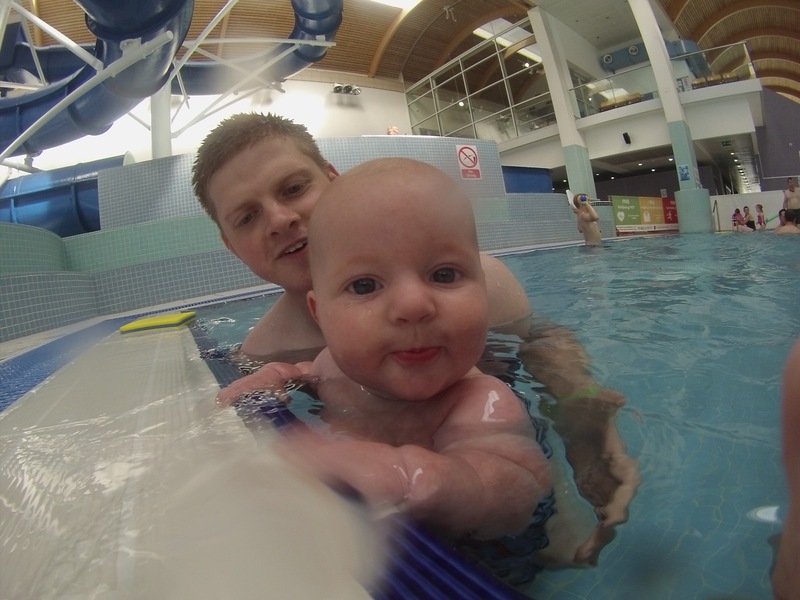 One of the nearby pools runs parent and baby sessions every weekend, it’s really cheap (in comparison to the usual rate) to get in as its only an hour long sessions. Oliver loved splashing about in the water, but wasn’t so keen about dunking his face in the water! He also had his first trip to the park and seemed to enjoy the swing for all of a minute when he then got bored and decided he would rather sit on the floor! 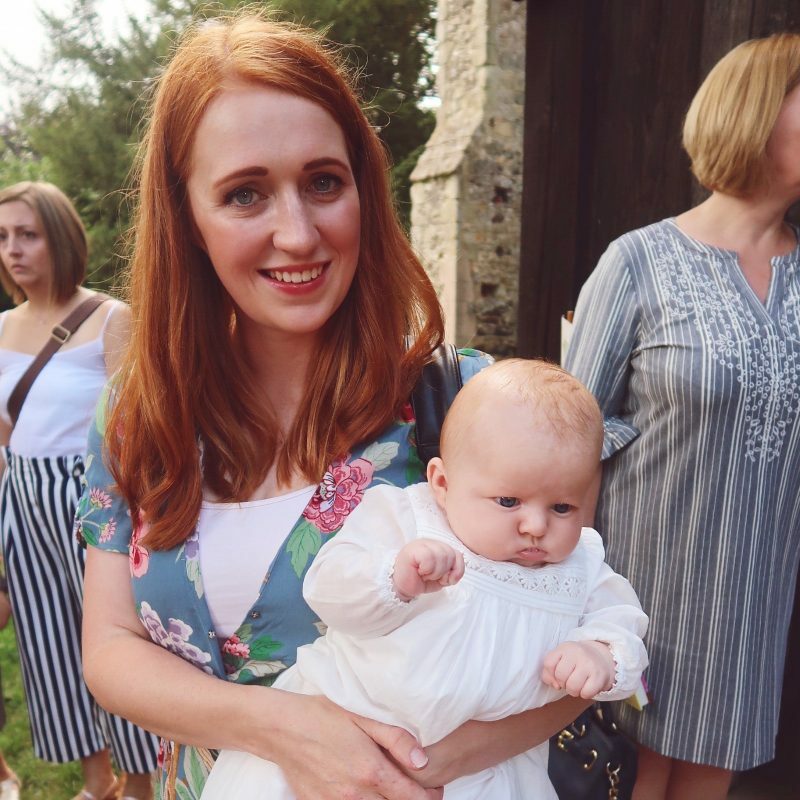 It was lovely because Stu’s mum was down from Wales and we spent the afternoon with her, she hasn’t seen Oliver since he was a newborn as its a very long journey for her to come and Stu hasn’t had any leave for us to go and see her. It is a shame she lives so far away, I’m sure Oliver would love to see her more (and vice versa), we are planning on hopefully going to see her in October.